In OnSite go to Tools > Setup > Basics > Users and at the bottom of the dialog click +. Enter the username they log into OnSite with. The login username is case sensitive., name., email phone number, and the username and password they log in with. Login username and password are case sensitive. Choose which Privilege Group the user belongs to. Go to Setting user privileges for information about privileges. Enter the user's first and last names. 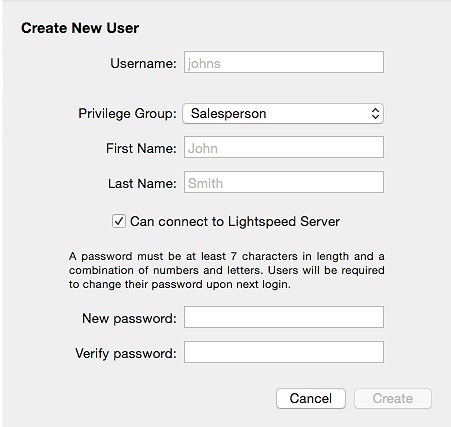 Can Connect to Lightspeed Server lets you set whether a user is allowed to log in. This is useful after an employee is no longer employed with the company. be changed the first time a user logs in. An administrator enters an initial password when the user is created, but the first time the user logs into OnSite they must change their password. be at least 7 characters long. contain numeric and alphabetical characters. For example, dynamite is not allowed, but orion1452 is. Be changed every 90 days. You have the option to not make passwords expire after 90 days. Be unique from the user's previous 4 passwords. You can optionally click Advanced and assign these settings to the user. Job product Associate a product you’ve created to represent any labor fees you want to charge for this user’s time when used in conjunction with Working with jobs and Working with timesheets. GSX tech ID used in the carry-in repair function of OnSite's integration with Apple's GSX parts ordering database. Launch Point of Sale after login Logs a user directly into the POS screen, and can be used in conjunction with privileges to prevent a user from leaving the POS and entering the Storemaster. In accordance with PCI Data Security Standards, OnSite disables accounts that have not been accessed for 90 days until an administrator unlocks the account in the user setup panel. OnSite disables user accounts that have had an incorrect password entered five times in succession. If this occurs, the account is locked for 30 minutes, after which the user can again try to log in. An OnSite administrator can unlock the account during this 30 minutes in the user setup panel. For more information see LightSpeed’s PA-DSS Implementation Guide.